About 60 percent of Russian citizens think Vladimir Lenin’s body should be taken from the Red Square Mausoleum and properly buried. However, 52 percent of respondents view the current situation as ‘normal’ or even ‘good’. According to the latest research conducted by the government-owned pollster VTSIOM on the eve of the Bolshevik leader’s birthday (April 22), 60 percent of Russians support the general idea of Lenin’s burial. This includes 36 percent who say that the founder of the Soviet Union should be buried as soon as possible. A further 24 percent say the authorities should wait until the generation that holds Lenin dear passes away. Thirty-two percent say they want no changes and prefer Lenin to remain in state where he is – in the Mausoleum right near the Kremlin. 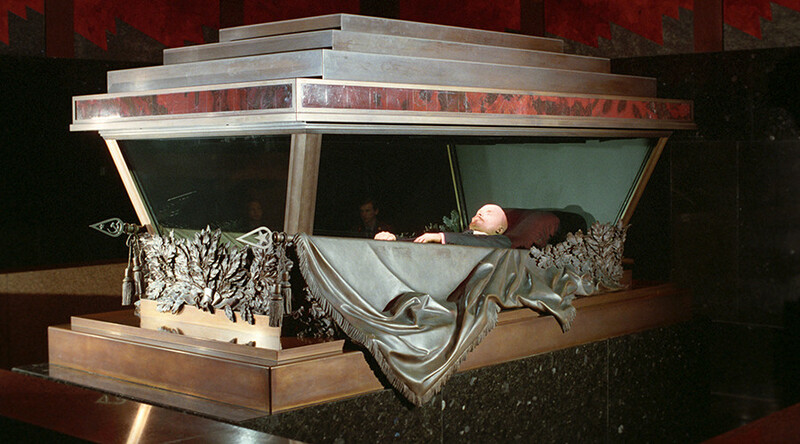 The same research shows that the average Russian has a neutral or even positive attitude to the fact that the embalmed body is on public display in a special structure in the center of Moscow. Some 35 percent answered that they saw nothing extraordinary in this situation and 17 percent said they preferred things this way. Forty percent answered that the current situation is wrong and should be changed. When researchers asked modern Russians what they thought of Lenin’s motivation, 65 percent answered that the first Soviet leader had worked in the interests of the majority of citizens. Twenty-three percent think this was not the case, while 31 percent of respondents maintain that Lenin’s accomplishments did Russia more good than bad. Twenty-three percent perceive a negative legacy and 35 percent say the positives and negatives were approximately equal. In addition, 63 percent of those polled said that they sympathized with Lenin as a person while only 24 percent said they harbor more negative sentiments. The head of VTSIOM’s research projects, Mikhail Mamonov, said the positive attitude to Lenin could be explained by general nostalgia for the Soviet Union and an attractive image created by the Soviet propaganda. At the same time, he noted that Lenin’s image has stopped being some king of a sacred symbol and most Russians now perceive the mausoleum as yet another tourist attraction. The issue of burying Vladimir Lenin’s body has been discussed in Russia since the days of Perestroika and usually the discourse intensifies before his birthday and the anniversary of the October Revolution. In 2011, the United Russia party launched an internet project offering citizens to vote on the subject - about 70 percent of participants supported the idea of burial. At the same time, researchers say that nostalgia for the Soviet Union is still high in Russia. Earlier this week the independent polling agency Levada Center released the results of research that showed that 56 percent of Russian citizens have negative feelings about the collapse of the USSR, with 28 percent claiming their sentiments are entirely positive and 16 percent deeming the question too complex to give an unambiguous answer. The same research showed that 58 percent of Russians want the Soviet Union restored (however, of that figure only 14 percent said that such project was realistic and 44 percent maintained that it was unfeasible, even though preferable).